You can’t be a blue cheese lover in Wisconsin without tasting Hook’s, a cheese company out of Mineral Point that always garners lavish praise from heartland caseophiles. The Hook’s stand at the Dane County Farmers’ Market in Madison – reputedly the largest market in the country – is always surrounded by people waving toothpicks, eager to hawk-dive into the sample bins. 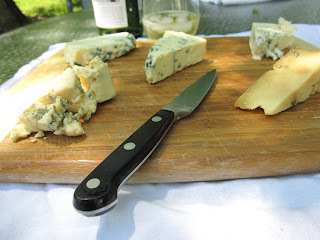 Tony and Julie Hook produce five, yes FIVE, different blues, and last weekend I was one of those clucking toothpick-wavers, eager to assemble a blue cheese tasting board from Wisconsin. You bet I tried all five blues, beginning with their original, a Danish-style blue that has received a series of awards at the Cheese Championships hosted by the Wisconsin Cheesemakers Association. What a nicely balanced cheese – sweet, perky, sharp, with a slightly vinegary finish. Still, the one that made me swoon was Hook's Blue Paradise, a pungent double-cream with notes of sour cherry and a cucumbery finish. Talk about a spreadable, edible cheese. It reminded me of some of the Irish blues I’ve been trying on the sly. 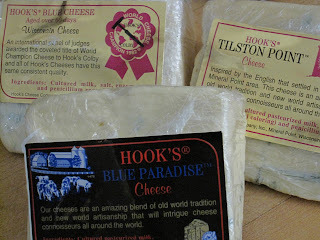 Hook’s Tilston Point, a crumbly wonder-thug of a cheese (bold, grainy, salty, pasturey), knocked me out of my hammock. The long-lasting flavor reminded me of the Rolf-Beeler Thurblau I tried a few weeks ago, a terrific raw-milk blue from Switzerland. Hook's Tilston is an English-style washed-rind blue, and it's certainly the most interesting and robust cheese in Hook’s blue pack. Would you believe I bought all three of these cheeses at the farmers' market for a grand total of about ten bucks? Talk about dairy value. 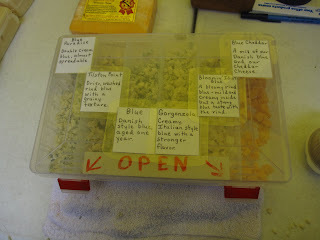 If you want to host a cheese party, Hook's offers an economical way to sample a wide range of blues. What a good looking cheese plate. I live in Beloit and will have to try that Hook's Tilston Point that knocked you out of the hammock! I just tried some Hook's Blue Paradise and the name really fits. It was creamy and delicious. I hope I can find the other ones you mentioned. Tony is crafting a new blue called Bloomin' Idiot. He inoculates the milk with blue mold spores, but doesn't pierce the wheels. Therefore, the rind grows blue mold, but the inside stays white and creamy. It's almost like a blue brie. The Blue Paradise is amazing. I actually live just a few blocks from Hook's Cheese in Mineral Point. I try not to pass by too often when they are open on Fridays because it's too dangerous ;) Everything they have is delicious!